Fred Claus isn't especially funny but it's well made, superbly acted and entirely watchable, provided you can stomach the sentimentality levels. 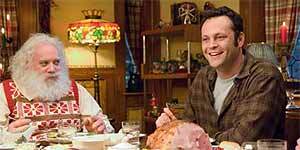 Vince Vaughn stars as Fred Claus, a disgruntled repo man who's grown up in the shadow of his saintly younger brother Nick (Paul Giamatti), better known as Santa Claus. When Fred needs money for a new business venture, Nick agrees to help him out on one condition: that he comes to the North Pole and works in Santa's workshop during the pre-Christmas rush. Before long, Fred is causing chaos amongst the elves and tension between Nick and Mrs Claus (Miranda Richardson). Worse, an efficiency expert (Kevin Spacey) is hovering in the wings and threatening to shut Santa down if he incurs three strikes. Vince Vaughn has made a career out of playing obnoxious characters with hidden hearts of gold and he's on good form here. Paul Giamatti is excellent as Santa and there's strong support from Rachel Weisz as Fred's long-suffering girlfriend and a digitally-reduced John Michael Higgins as Fred's elf roommate Willie. In addition, Kevin Spacey underplays to perfection as the officious Clyde, even if the filmmakers do turn his presence into a cheeky plug for the new Superman franchise. The effects are fine and the script manages to inject some life into the usual cliches. There's also an impressive series of cameos for the film's funniest scene, when Fred attends Siblings Anonymous. The film's biggest problem is that, Siblings Anonymous aside, it's not especially funny, though the performances ensure that it is at least consistently amusing. Similarly, it's a good twenty minutes too long and you'll need a tough stomach to make it through the layers of syrupy sentimentality towards the end. In short, Fred Claus is an entirely watchable family movie that's worth seeing for the performances. On the scale of Christmas movies past, it's not as good as Elf but it's nowhere near as bad as, say, The Santa Clause III either.